We review the latest release of this popular system optimization software from IObit. 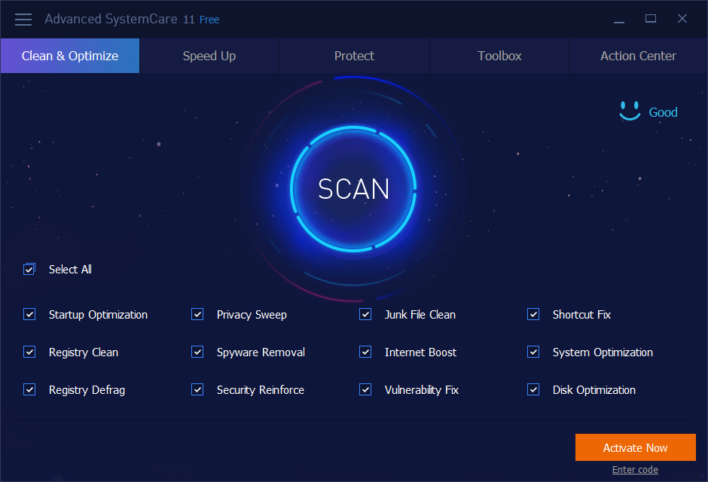 Advanced SystemCare 11 is a handy all-in-one, and easy-to-use, PC optimization program that cleans, optimizes, speeds up, and protects your system, as well as secure your online privacy. Until the advent of DIY system tools to keep your tech running like new, too many users flooded the landfills and emptied their bank accounts every few years, trying to keep up with the changing PC landscape. When a computer took too long to load or connect to the internet or otherwise became “squirrely,” it was just considered par for the course that it was time for a new one. With better user-friendly software meant to tackle both the common and the not-so-common causes of tech lag, you can get a lot more years of use out of your PC. 1-click approach lets users easily clean up leftovers, registry entries even privacy traces and junk files. One of the best free PC clean up tools around just got a facelift and a few new optimization features that make it even faster and more powerful. IObit’s Advanced System Care 11 is a free top-notch product that still maintains entry-level functionality, meaning users at every level and need can benefit from it. Optimized FaceID, Homepage Advisor and Ads Removal features ensure a better privacy protection. Another new feature for version 11 is the addition of a disk optimizing engine to the Clean & Optimize module, which promises to improve disk performance by intelligently organizing drive data for a more effective computer. In tests, we did notice performance improvements, and enjoyed the redesigned and more intuitive Performance Monitor feature. Touches like the high CPU usage alert and Turbo Boost functions make optimizing your machine that much easier. Advanced SystemCare 11 optimizes FaceID, Homepage Advisor, and Surfing Protection and Ads-Removal, for better privacy protection. The CLEAN feature receives a welcome upgrade, making it faster at not only the junk files cleaning but also on the privacy sweep. As a result, the whole cleaning process can be completed more than 150% faster over the version 10. The security reinforce is redesigned to fix more system weakness such as vulnerabilities of RDP, UAC. With so many new tools at your disposal, it’s logical to wonder how the “freemium” model for this software is going to protect. Never fear…there isn’t one. Advanced System Care continues to be a 100% freeware title, which has led to its award-winning status and more than 100 million worldwide downloads. Advanced SystemCare 11 makes it ideal for the casual user who wants a set-it-and-forget-it option for keeping their PC up and running at optimal speed while also blocking security threats and disruptions. Test drive it for yourself – download Advanced SystemCare 11 here.